I waited almost 2 hours before I saw some sign of support for Sisi’s call. Tahrir was pretty empty compared to June 30 and July 3rd. I began to wonder if people would even show. But the sun got unbearable and I decided to return home and watch the news and I was shocked to see my TV screen filled with people less than 10 mins after I had left an almost empty Tahrir. What would you call this Sisi propoganda or Media magic? For one thing it did bring to light the power of media and those who don’t visit Tahrir, who else do they have to trust? Please click on the link above to view the Photo album. My apologies for the brief break in writing. I was, one contemplating what to write about as there have been no major developments in Egypt; and two, I was recovering from a very bad food allergy. The third, but equally influential reason is that I am tired of all the negative media stories. It is, as though, the media has left no stone unturned in telling the world how unsafe the country is; and they are the torch bearers in demonizing the Morsi camp. Now, I am not Egyptian, but I have lived here long enough to not be just a mere observer. So I find myself getting dragged into, or rather I drag myself into every conversation about how great the army is or how barbarian the Ikhwaan is. It is hard to stay neutral when I have witnessed how, just at a blink of an eye, and without an official election Egypt’s first democratically elected president was overthrown. I never imagined I would live to see a coup. But before I move on, I would like to make my position clear. I am neither a firm believer in democracy for countries where there is little to zero understanding of what it means and when the public is not ready for it, neither am I a proponent of mixing religion and politics. I speak from experience- I have lived both situations- and seen how hypocritical and ignorant the former system can be and how oppressive and ignorant the latter. And so what Egypt has been suffering from and continues to suffer from can be best described as a lack of understanding of the democratic system, just as the ousted regime was accused of Islamizing the state. But there is no middle ground. Everyone I have talked to is quite convinced that the other is the devil. So in this highly polarized state, what is the most feasible solution? Pondering over puffs of my shisha in a sparsely crowded cafe in Zamalek, I wonder if there is even hope for reconciliation? Will there dawn a day when liberals, army, and conservatives can live in peace amid each other? And more importantly is there a role for the international community to play? I will first present the views of those around me and then provide my own analysis as a foreigner being affected by the schism. On Friday July 19, I had planned on attending an anti-coup demonstration. I wished to confirm the locations of the planned march, so I posted my question on a popular Facebook portal. One would expect that the response would be a list of locations. Instead what followed were a range of angry and some concerned comments the likes of which you can see below. And then I was sitting a café with friends in an upper class neighborhood and one of them was so worked up about all the raod blocks and he didn’t blame the army who was blocking off roads, but the “bloody Ikhwaan”. He said, and I quote, “I would like to see them all die and burn in hell. They should be shot dead!” Yes, word for word. I didn’t respond but my brain was thinking back to when I visited Iran in 2010, where the 20-somethings youth were speaking ill about Islam, the brunt of which they had been forced to bear because of their parents’ doing in 1979. So what the mullah’s fail to understand in Iran and what the liberals here fail to understand is that too much of anything is not such a good thing! And right now it feels like there is too much of injustice, division and hatred in Egypt! So back to my plan to join the anti-coup protest- I went- and I am glad I did for I witnessed unprecedented participation by modern women and men. “I voted for Morsi because anyone is better than Shafiq. And I plan to stand by my vote. The army has no right to come and speak on behalf of the people. And were they only counting the voice of the people in Tahrir? What about those in other cities? And what did he do? Did he kill someone-no. Did he order the killing of someone-I think not. Even Bush was given two terms. And I feel weary about the future of my country if the army stays in control much longer. Let’s go to the ballot again.” says an unveiled Asmaa Haittham, Account Manager at a Cairo firm. So while there are divisions, both sides are in agreement that they should have early elections. And both camps are convinced they will sweep majority of the ballots. But let us not get into this; instead let us latch on to the point of agreement- Elections! The only question here is: Will the army respect their word and can they be trusted? 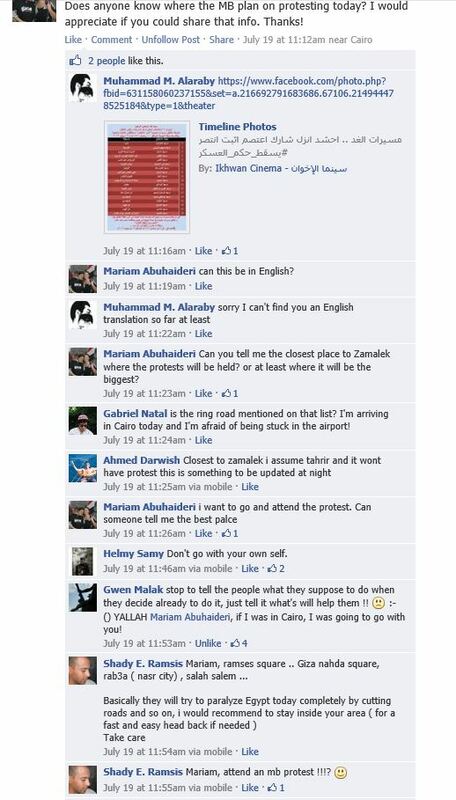 I am a bit skeptical after they killed 52 Morsi supporters and injured hundreds at a sit in outside an an Army club. As for my friend who said that the Ikhwaan should all be killed because he has to go through road blocks and checkpoints, I can only hope he finds peace. His comment and those from many others who like him hate the Ikhwaan, prompts me to believe that while Egypt is not in a civil war, the country should brace itself for the “R” of Disarmament, Demobilization and Reintegration because with this level of hatred for each other, the winning side will need to learn to reintegrate the opposition. Just to give you a further sense of the situation, a young coworker said she would accept the candidate who wins the election, even if he is from the Ikhwaan, but not Morsi himself of course. “Morsi was so dumb. He could not speak English and spoke dully. We can’t have someone like him represent Egypt.” She says. I remind her that not all Presidents speak English. So was it really about Morsi not having been able to achieve the demands of the revolution or about his lack of charisma? It is hard to tell. The international community is being fairly cautious. Most have issued travel warnings for Cairo and evacuated their citizens. Yet, many choose to stay put in Egypt because of work, marriage, or for the sheer fact that they are not unsafe. Indians and Europeans particularly are the bravest of the lot. Americans have at best vanished; this when their government continues to fund the military. Something is amiss because if their government is so tight with the Sisi, their security should be guaranteed. But of course not, because their dirty politics has now come to surface. Both sides don’t favor America and a handful of its allies. They first issued orders against a coup and threatened to withdraw aid to Egypt in the advent of a coup. And now they have been caught doing the contrary. What do we call this? Dirty American politics? A metaphor comes to mind: As adaptive as a chameleon. America and Britain best keep away, but that this happen is only an illusion. Because Israel is too weak and cowardly to stand for itself. There are rumours that a stable Egypt would be threatening to Israel and they have a hand to play in this mess. Perhaps, but Egyptians need to outsmart the Israelis and stablize their country for themselves. “America should stand by their principles and not support bloodshed and instability and if they cannot do that, stay out of our business,” explained Asnaa Alanajar, another modernly dressed female Morsi supporter. 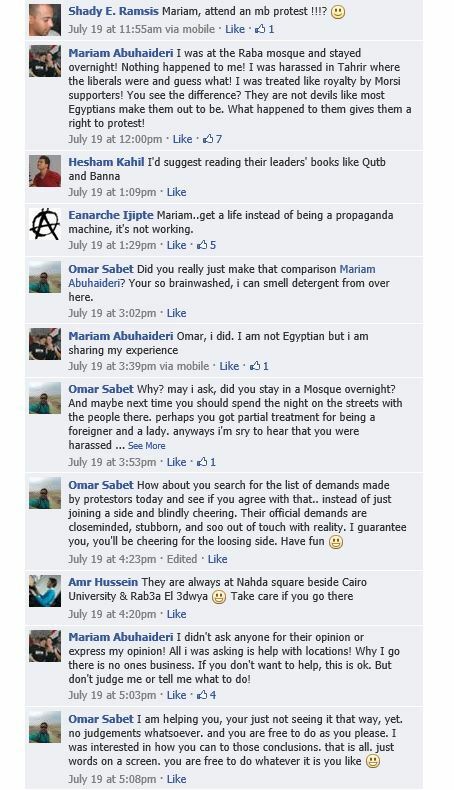 Asnaa is an interior designer in an upper class neighborhood of Cairo and attended the anti-coup protest last Friday. Now, all of this is a big mess and I am not very optimistic for Egypt’s future. In Iran, I would have suggested the return of the monarchy, but with Egypt, can the same be suggested? And who then, if not a monarch, can unite the people of Egypt? Perhaps there are people like Nancy who are independent and can take on this responsibility of pulling Egypt out of the soup it is in now?